Revellers who drop takeaway remains in city centres could cause fast food shops to be closed, a litter campaign group warns. Councils leaders will be told at a conference in Manchester on Tuesday that the owners of chip shops, as well as kebab and burger merchants must clean up their act. Unless they make more effort to reduce littering, they could face strict measures to close them down. Keep Britain Tidy Chief Executive Alan Woods, said: "What we are recommending is that unless traders promote the anti-litter message via posters in their shops and pay a levy to get rubbish cleaned up - they should have their licence to sell food through the night revoked." 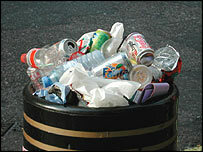 Fast food rubbish is a major concern for councils across the country. Alun Michael, minister for the urban quality of life, will attack "after dark litterers" and highlight new initiatives to help target those who litter. These include a campaign in the North East, where 15,000 school children have been targeted with the anti-litter message. Schemes in Lewisham in south east London and Newham in north east London are trying to enlist the help of 1,000 citizens in order to identify problem litter areas. In Bolton a project aims to get deprived neighbourhoods the same cleaning services as affluent areas, and a campaign in Stoke-on-Trent is aimed specifically at curbing fast food litter. It has been so successful that Sheffield and Birmingham are planning to follow suit. The litter problem is at its most serious on weekends and public holidays, with UK street sweepers shifting over 4,000 tonnes of trash every New Year's Day. One of the problems blamed on fast food waste is the rise of Britain's rat population - up 24% over the last two years.